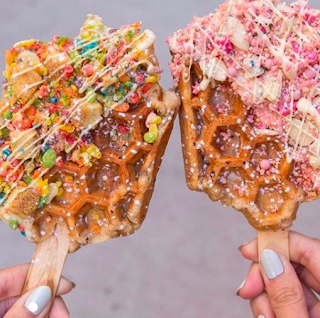 These are candy coated waffle pops and they're a huge hit at the Coachella Music Festival. What is great about these pop is that they're relatively easy to make and completely photo worthy! In honor of early summer creeping in and the days getting longer, we decided to give you a quick guide on making your own festival-inspired treats, specifically these waffle pops. When you think of festivals, you probably think of summer and bringing your friends together, complete with bright colors and trendy bohemian outfits. With music festival season coming into full swing, surprise the guests of your next get-together with a spread of colorful, summery, festival-inspired candies from unicorn colored candy bars to brightly colored flowers. Once you've got your waffle mix ready to go and the iron is hot, pour the mix in the iron. IMMEDIATELY lay your popsicle stick on the batter with about 1/3 of the stick hanging off the edge of the iron. You'll want enough room to hold the waffle pop. Once they're done, carefully remove the waffles with a fork and allow them to cool. Once they're cooled to room temp, you can cut them in serving portions and then the fun begins. The type of waffle you make is really up to you, but we encourage you to be creative and try things that you normally wouldn't. At Sweet Treat Supply, we make candy making fun and easy. With our selection of tools and supplies, you'll be making blog-worthy treats like a pro without the stress or mess. Liven up your next gathering with candy making and decorating, or simply make your treats ahead of time to surprise your guests. The only thing that's easier and quicker than making these candies might be eating them!